-Synergy between members both on and off the field. In short, what we wanted to achieve is having a professional team consisting of like-minded people where humor and comradery have a high priority. After the team was setup it grew to a full element in no-time and became active on the fields of Schoten, Duffel, Mariembourg, Yellowsands (Geel),The Valley and many others. Weapon replica’s are (still) illegal to own and use in The Netherlands. Because of this BBE-AT rents a storage room at Shurgard in Antwerp to store all replica’s. BBE works using an element structure, which is the historical format for BBE considering it’s roots in CQB. An element regularly consists of 5 operators, although the number of operators available may cause its size to vary. 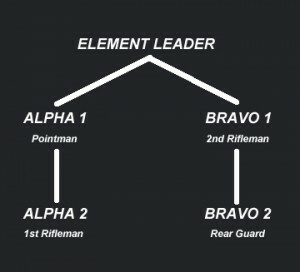 The Element Leader’s primary task is to command. While circumstances may necessitate his participation in battle, the EL’s first priority should always be to maintain a position that enables him to effectively direct the team’s actions. He’s responsible for plotting both tactics and strategy. In this role he is supported by the input of the operators. The point man occupies the lead position. His job will be to lead the assault team throughout the operation. He is also the element’s primary shooter. The Point Man should have superior leadership abilities; second only to the Element Leader’s skills. He must be able to make independent decisions concerning the immediate situation, yet still operate within the boundaries of the Element Leader’s intent. He is the second man, directly behind the pointman. The first rifleman works closely with the pointman, often in a supporting or covering role. It’s crucial to have synergy between the pointman and first rifleman, as they commonly spearhead an assault. The fourth member of the team is the secondary clearing man or rifleman. The function of Blue varies, depending on the EL’s intent. They may be used supporting Alpha or functioning independently, flanking an opponent or creating diversions. Some find this role to be the least important. In reality it is an extremely important role. Outflanking a team is almost always an ever-present risk to the team. A clever opponent will not try to hit the team along the direction it is advancing. Most of the team’s firepower is concentrated in that direction. Instead, he can wait until the last man passes then strike from the rear.